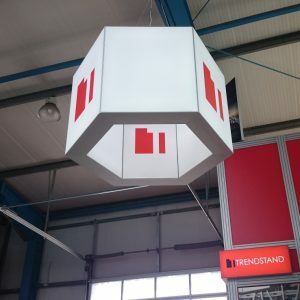 Beste Qualität für Ihre großen Auftritte! 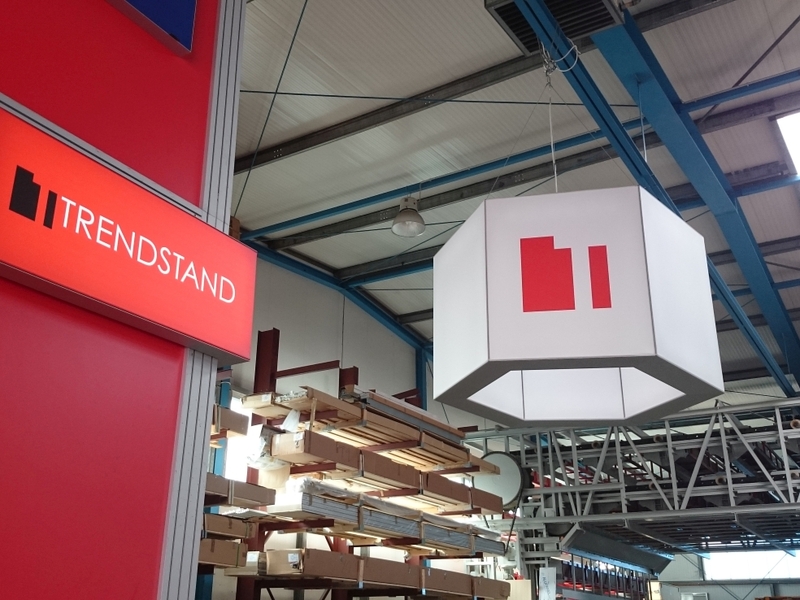 TRENDSTAND’s ultra-stable T3 and T5 LED frames for double-sided mounting of digital prints have for years been leading solutions in the market of lightframes with LED rim-feeding. 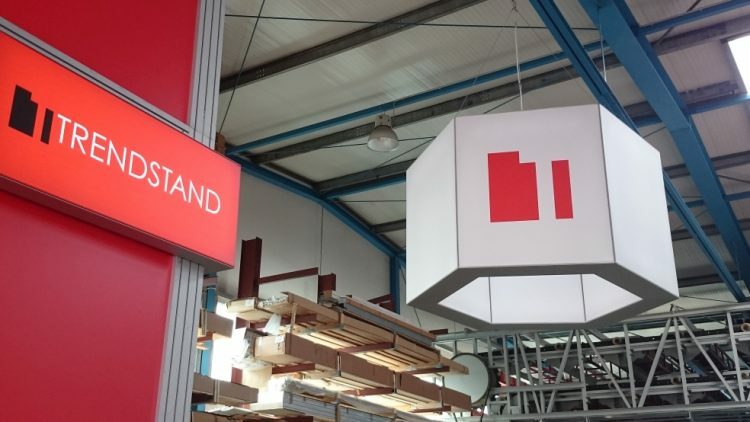 Now with its new T5-3D TRENDSTAND is bringing a variant which allows for three-dimensional wall structures. 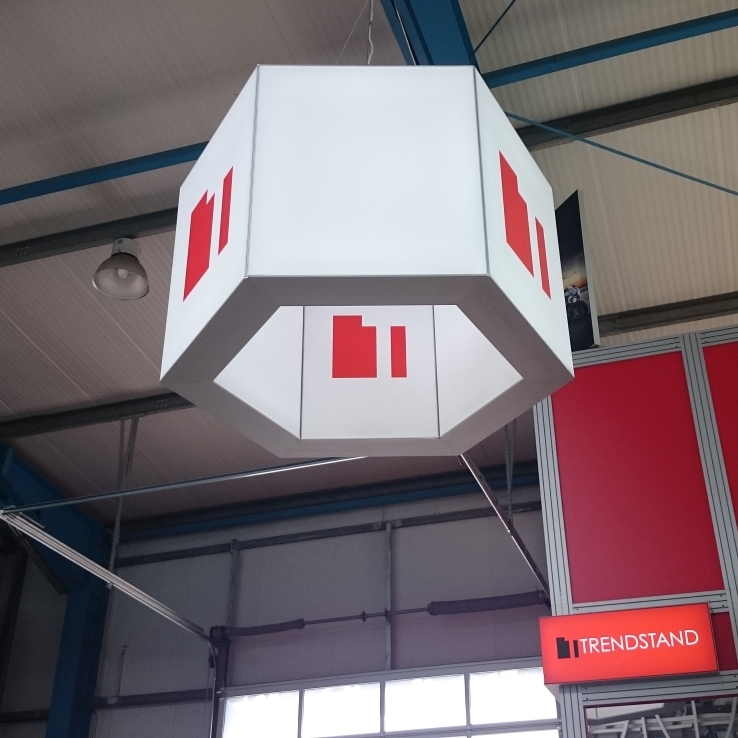 The special features of the TRENDSTAND solution: there are no dark shadows towards the edges, and any angle between 180° and approximately 75° is possible. This allows not only for L forms, U forms, and rectangles, but also for polygons, meanders, and free forms. Aside from light walls and backscreens, there are of course a lot more possible uses for T5-3D. 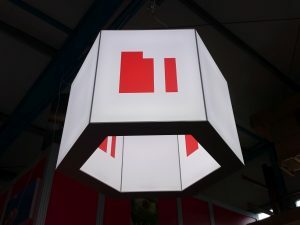 Ceiling ads (see above) and also illuminated counters are typical applications that are ideal especially at trade fairs. In an environment where everyone tries to attract attention, such an object purposefully guides the eyes of customers where you want them: on you and your products. But also reception desks with integrated T5-3D lightframes stand out in an impressive way, e.g. at gyms, hotels, or galleries. Of course, T5-3D LED lightframes are flexible not only in terms of angles. 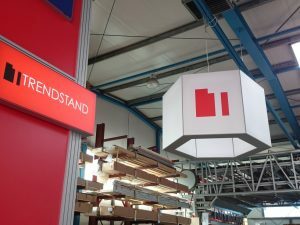 Just like all TRENDSTAND products they are part of a modular construction system, and can thus be integrated in complex builds. Also, they are easily transportable in rod-shaped packages. Or are you uncertain about changing dimensions in future uses? No problem, in case the dimensions of LED lightframes have to be altered, only specific parts have to be replaced or reworked. This way expensive new purchase is most widely avoided. 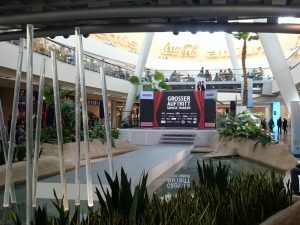 Still, one of the most important arguments for lightframes with digital prints is and remains the variability of advertising messages. Simply put in a new fabric, and right away your customer approach is up-to-date again. 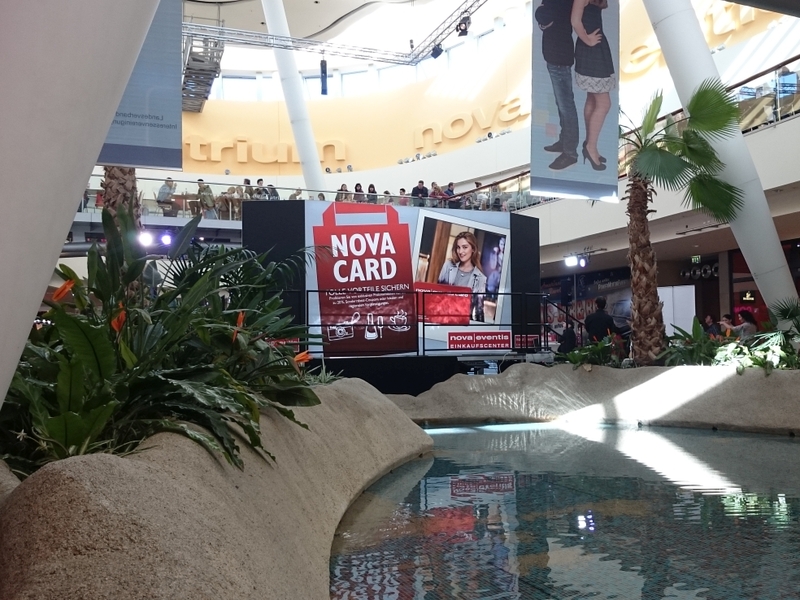 At the beginning of March—even before the official market introduction—Leipzig’s agency for digital media, Pax Media, installed the first publicly displayed T5-3D lightframes at the Nova|Eventis shopping center. 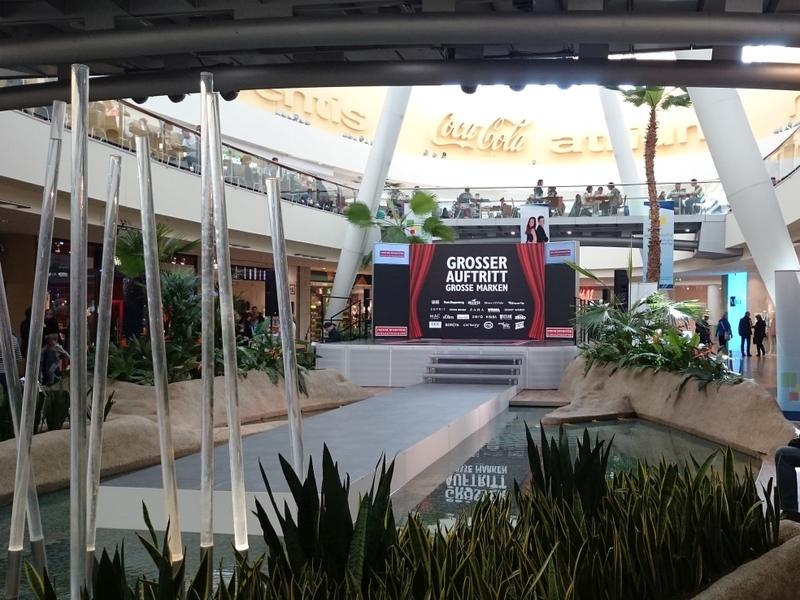 Here in one of Germany’s biggest malls the three-wing LED frame equipped with embedded monitor screens serves as back screen of the new event stage. At this point we would like to thank the center management of Nova|Eventis for the kind photo permission and Pax Media for the challenging project. 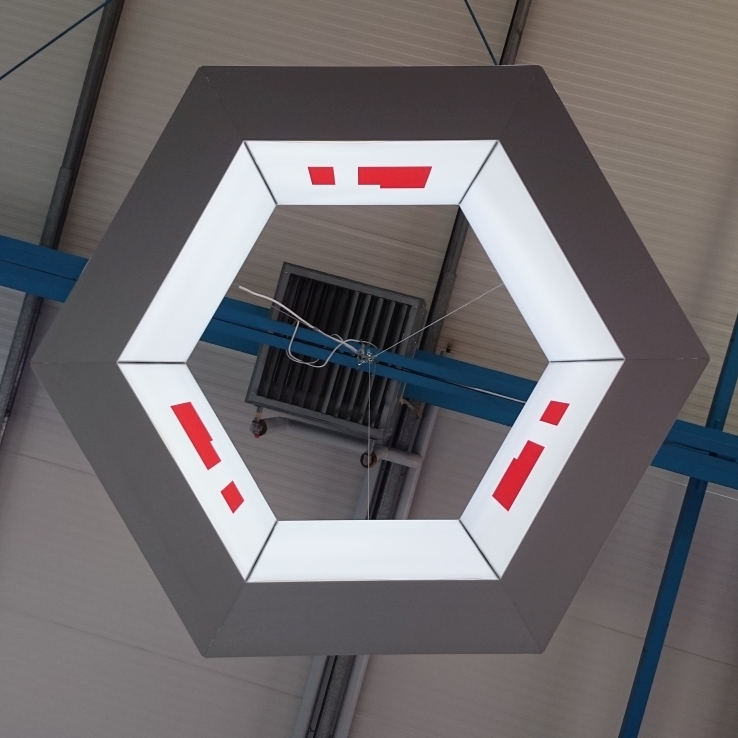 Of course, further development of LED rim-feeding does not end here. Extra slim frames are currently in the final stages of development, and so are round variants. More on this coming soon. Copyright © 2019 TRENDSTAND. All rights reserved.